Year 1 will come to school through the main car park at the front of the school on Marlow Road. Lions – please go to the right of the main door. There is a paved area to stand on (see diagram). Giraffes – please use the doors at the far end of the Marlow Road Hall (see diagram). 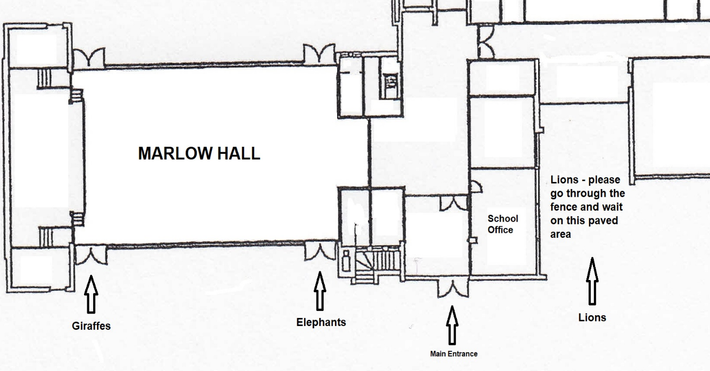 Elephants – please use the hall doors closest to the main entrance (see diagram). We will be restricting parking to keep these areas safe and fencing will be put in place. Construction vehicles will not be moving during this time to ensure the safety of the children. Please ensure that the children arrive at school promptly. Reception and Year 2 – no change to the current arrangements – please use your normal entrances. Reception/Year 1/Year 2 will be using the grassed areas for breaks and lunch times. Please make sure your child has a change of footwear to play in (trainers or wellington boots). Key Stage 1 children will use the entrances listed above, i.e. the same arrangements as those used at the beginning of the day. Any Key Stage 2 children that normally walk down to the Key Stage 1 playground must be met at the school office. I apologise for the delay in informing you of these arrangements, but the building company has only recently confirmed the dates and times. When we have more information about the works that will take place after February half term, we will be able to update you again. If you have any queries or concerns, then please see the class teacher in the first instance. Thank you for your continued co-operation.